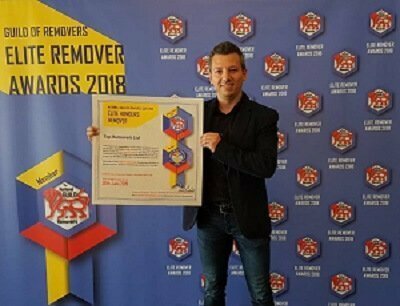 We are proud and excited to announce that we have been presented with the ELITE HONOURS REMOVAL Award by the National Guild of Removers and Storers. This highly prestigious award is annually given to the leading companies from England and Ireland who had achieved an outstanding quality of the performed services as well as an impeccable customer service. Every Guild member’s actions are strictly monitored during the course of each year and depending on the end results the company may gain the chance to be nominated. The winners receive an award based on overall performance, quality of the offered customer service and the level of customer satisfaction. The award ceremony was held on 23 May 2018, in St Albans and gathered in one place the best of the best in the removal branch. This annual event was hosted by the NGRS who is an independent quality and standard monitoring organisation. The National Guild has strict rules regarding the services provided to the clients so you can be sure that by hiring a Guild member, you have made the right choice. Receiving such an award while being in the industry for just over 10 years is a great honour for us and is an unmistakable sign that we are doing something right. The fact that we were chosen alongside other members with close to half a century of experience proves we are a reliable removal company. Our first priority is the clients’ needs, and how can we satisfy them without compromising on the quality of our removal services.